This is a common component of salt marsh vegetation in Northern Ireland. 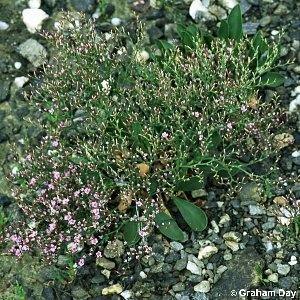 It is the only species of sea-lavender (Limonium spp.) found in the Province's saltmarshes. This plant has a basal rosette of spoon-shaped leaves and a much-branched inflorescence of small lavender-blue flowers, the whole plant reaching about 8 inches (20 cm) in height.